For many people, the thought of Italy brings romance, style, and great works of great and beautiful art to mind. It's no wonder, then, that Italian interior decorating styles are so popular right around the world. After all, who doesn't want a romantic, stylish home - to be both proud of and show off to your friends and family (and who knows maybe even get some magazine coverage; the ultimate accolade). To get the Italian look in your home, follow these simple decorating tips. One of the first steps in any Italian decorating scheme is to paint your walls a rich cream, beige, or red color. This sets the "tone" for the rest of the decorating proect itself. If you prefer to give the walls a faux finish, you may want to make them look like leather, marble, or suede. The plaster or stucco look also is a great choice for Italian themes; it'll depend on what finish suits the room itself. The next step is to take a look at your floor and visualize what you want the finished floor to look like. There's tons of choices. You can choose from marble, mosaic, or natural stone floors; any of these are ideal. However, if you have a hardwood or wooden floor already , you can cover them with a rich tapestry rug or a Persian carpet (not strictly Italian in origin but really complements the style). With your walls and floors in place, it is time to take a look at the ceiling. Of course, a standard white ceiling is fine, but why not add a mural to your ceiling instead? This doesn't have to be a huge task as you can find lots of mural stencils online. Wouldn't you love to have something like the Sistine Chapel adorn your living room? As long as the ceiling mural isn't overdone it can be very tasteful. If you opt to leave your ceiling white, be sure to add some crown molding to blend it with the rest of the room. Now, it's time to add the furnishings and fabrics to the room. Fine antiques or reproductions look right at home in rooms decorated in this style. Look for graceful curves and dark or gilt finishes on the furniture or objects you choose. 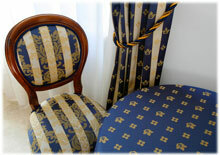 Curtains can be sheers, silk, or velvet; again it will depend on the actual room itself.. Choose rich tapestry prints or intricate beading for your throw pillows as the last and most fitting touch for this type of room. Finally, don't forget to add accessories to complete the rooms Italian theme. Small pillars, candles, statuary, and mosaic pieces are idea and can all be purchased quite cheaply. Mirrors and fine art add a decorative element, as well. For the perfect finishing touch, consider adding a chandelier; it can be the ultimate finishing touch for this style of room. Once your room is finished, you will be able to enjoy the beauty and elegance of Europe without even leaving your home. Cappucino anyone?